Citation Information: J Clin Invest. 2018. https://doi.org/10.1172/JCI92981. Citation Information: J Clin Invest. 2018. https://doi.org/10.1172/JCI93198. Citation Information: J Clin Invest. 2018. https://doi.org/10.1172/JCI97684. Citation Information: J Clin Invest. 2018. https://doi.org/10.1172/JCI94516. Citation Information: J Clin Invest. 2017. https://doi.org/10.1172/JCI91893. 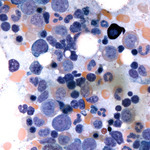 Oncogenic addiction to the Fms-like tyrosine kinase 3 (FLT3) is a hallmark of acute myeloid leukemia (AML) that harbors the FLT3–internal tandem duplication (FLT3-ITD) mutation. While FLT3 inhibitors like sorafenib show initial therapeutic efficacy, resistance rapidly develops through mechanisms that are incompletely understood. Here, we used RNA-Seq–based analysis of patient leukemic cells and found that upregulation of the Tec family kinase BMX occurs during sorafenib resistance. This upregulation was recapitulated in an in vivo murine FLT3-ITD–positive (FLT3-ITD+) model of sorafenib resistance. Mechanistically, the antiangiogenic effects of sorafenib led to increased bone marrow hypoxia, which contributed to HIF-dependent BMX upregulation. In in vitro experiments, hypoxia-dependent BMX upregulation was observed in both AML and non-AML cell lines. Functional studies in human FLT3-ITD+ cell lines showed that BMX is part of a compensatory signaling mechanism that promotes AML cell survival during FLT3 inhibition. Taken together, our results demonstrate that hypoxia-dependent upregulation of BMX contributes to therapeutic resistance through a compensatory prosurvival signaling mechanism. These results also reveal the role of off-target drug effects on tumor microenvironment and development of acquired drug resistance. We propose that the bone marrow niche can be altered by anticancer therapeutics, resulting in drug resistance through cell-nonautonomous microenvironment-dependent effects. Citation Information: J Clin Invest. 2017. https://doi.org/10.1172/JCI93801.